US ▼ 2009-08-06 $19.99 ? Sonic the Hedgehog (ソニック・ザ・ヘッジホッグ) is a 2006 video game released for the Xbox 360 and PlayStation 3. A Wii version was planned but reworked into Sonic and the Secret Rings. 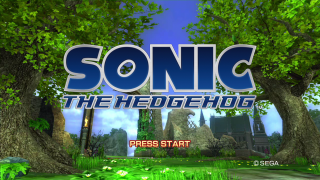 It was developed by Sonic Team and released to celebrate the 15th anniversary of the Sonic the Hedgehog franchise. The game shares its name with two earlier video games, a manga, a television series, a comic book series and, of course, the character of Sonic the Hedgehog himself. To disambiguate, the game is frequently referred to as Sonic the Hedgehog 2006, Sonic 2006 or Sonic '06. Sonic 360 (despite not being exclusive to the Xbox 360) and Sonic Next-Gen were also common names when the game debuted, but have since fallen out of use. Sonic '06 was the first Sonic game to be released in what is now considered the seventh generation of video game consoles. It builds on ideas first floated in Sonic Adventure and Sonic Adventure 2 and, to a lesser extent, Sonic Heroes and Shadow the Hedgehog. Many of the characters were subtly redesigned (save for Dr. Eggman, whose appearance is far more drastic), and settings were made more realistic presumably to take advantage of the hardware. Sonic '06 remains a controversial release in the franchise and was the subject of extremely negative review scores on release. It is widely considered one of the worst Sonic the Hedgehog games in the franchise, followed closely by 2014's Sonic Boom: Rise of Lyric. The objective of the game is to complete all of the levels and ultimately fight a boss in one of the final levels, which is unique to each character. Ultimately, all characters face off with Solaris, the Sun God of Soleanna, in the Last Story segment. Each character has moves or attributes which make them unique to one another, such as Sonic's ability to perform the bounce attack. Although each character plays the same levels, each character's unique abilities allow him or her to get to different areas of each stage, or deny them accessing to certain areas and items. Gameplay is broken up into two types of stage, similar to Sonic Adventure. Action Stages are where the bulk of the gameplay takes place, whereas Town Stages are free-roaming locations where the player can talk to non-playable characters and explore, as in Sonic Adventure's Adventure Fields. For each of the action stages in the respective stories, gold medals are obtainable by achieving high ranks in these stages. There are a total of eleven stages. A ranking system exists for each of the levels and town missions, providing ranks calculated from score, Rings, and time remaining. The highest rank is S Rank, followed by A Rank, down to the lowest, D Rank. Gold medals can be obtained by achieving high ranks in these stages. Sonic the Hedgehog features two styles of multiplayer gameplay, which allow two players to either cooperate or compete. The first mode, Tag Mode, is a co-op type of play between Sonic, Silver and Shadow. Two players, each one controlling a different character, must work together to clear levels and collect Chaos Emeralds. In this mode, lives are shared. The second multi-player game mode available is Battle Mode. Battle mode pits two players against each other and has them race to a goal in the selected level. Before release, it was rumoured that the game would contain mini-games that would allow up to four players to play simultaneously/alternately (Quiz, Race and a few others). However, these do not exist in the released version of the game. There are no online multiplayer capabilities, even though the back of the game case describes the game as online capable. The only use for the mentioned online capability is the game's downloadable content. There are three fully playable characters, who are progressively unlocked by playing each character's story in the game. Only Sonic is available initially; Shadow and Silver must be unlocked. In addition, the player may control partners for some sections of a level, thus aiding Sonic with their unique abilities. Sonic the Hedgehog: Sonic's mission is to go to Soleanna to rescue Princess Elise and prevent Doctor Eggman from unleashing the power of the Flames of Disaster. Sonic's story has high-speed, Sonic Adventure-style gameplay. Sonic's allies are Tails, who can use his two tails to fly to higher areas; and Knuckles, who can climb to otherwise inaccessible areas and glide through the air. A story arc allows Sonic to turn Super and to share this power with others. Shadow the Hedgehog: Shadow is a G.U.N. agent and is assigned to rescue another G.U.N. agent, Rouge the Bat and retrieve the mysterious Scepter of Darkness. Shadow uses vehicles, chaos powers, and variations of the homing attack to progress through the game. Shadow's allies are Rouge the Bat, a jewel thief and government spy who, like Knuckles, can glide through the air and climb; and E-123 Omega, who can hover and shoot rapid-fire. Silver the Hedgehog: Making his debut, Silver is a time traveler who has arrived from the future. He comes to save his home world and stop the mysterious Iblis Trigger. Silver's gameplay involves the use of telekinetic powers to pick up objects and throw them at enemies as well as to levitate in the air for differing amounts of time, depending on his energy bar. Silver's allies are Blaze the Cat, a princess from another world, with the power to control fire; and Amy Rose, who can double-jump, use her Piko Piko Hammer, and turn invisible. Doesn't appear in the game at all until the Last Story, where Mephiles uses all 7 gems to fuse with Iblis during a cutscene. Spends most of the game buried under Dusty Desert. Mephiles hunts it down near the end of Shadow's story, acquiring it just before the boss fight of Mephiles Phase 2. The first time we see this gem is in Mephiles' possession when he recruits Silver and Blaze in Crisis City. He presumably acquires it after sending himself, Shadow, and Rouge to the future from Kingdom Valley. Mephiles apparently carries it around with him throughout the rest of the game, although we only see it again at the start of the Last Story when he uses it as a distraction to allow him to skewer Sonic. This gem enters the story when Sonic, Tails, Knuckles, Shadow, and Rouge find it in Iblis Phase 2's cave after Flame Core in the future. It travels back to Soleanna with Sonic and stays with him for a while. After Sonic's Kingdom Valley, he uses the turquoise gem to open the portal to a few hours in the past with Silver so he can save Elise from the Egg Carrier. Sonic leaves the Emerald with Silver and Blaze, who then take it 200 years into the future to fight Iblis Phase 3. Silver sees the Duke of Soleanna seal Iblis inside Elise using this gem at the Solaris Project 10 years ago. Silver then takes it with him to the present (thereby removing it from time for 10 years and precluding any super transformations in the decade before the adventure), and later uses it to open the portal to a few hours in the past with Sonic. The grey gem then goes with Silver and Blaze 200 years into the future to fight Iblis Phase 3. This Emerald stays with Team Dark for most of the game. Shadow and Rouge find it as their Crisis City mission objective 200 years in the future. Rouge takes it back through the portal to Soleanna as Shadow fights Mephiles Phase 1. The bat gives it to Omega after Tropical Jungle, who goes into stasis for 200 years in order to deliver it back to Shadow during the fight. Omega, Shadow, and the green emerald return to the present, and Shadow goes on to use it for Chaos Control to kick Silver in the head. Shadow then takes the Emerald with him to the Solaris Project 10 years ago, where he uses it to seal Mephiles inside the Scepter of Darkness, then returns again to the present. However, in Shadow's final Dusty Desert cutscene, crystalline Mephiles suddenly has the green gem in his possession along with the yellow one, apparently having snatched it from Shadow offscreen (perhaps during the confusion of the Scepter's explosion?). This is the Emerald which finds itself locked in an ontological loop over the course of the game. The blue gem is implied to have been Princess Elise's lucky charm for many years, and Dr. Robotnik attacks the Festival of the Sun to steal it from her. Elise throws the jewel to Sonic as she is being kidnapped, and Sonic takes it to White Acropolis as a ransom, where it goes in Robotnik's time machine. Silver later takes the blue Emerald from White Acropolis after beating the Egg Genesis, and uses it (with Shadow's assistance) to open a portal to the past and the Solaris Project. Silver then gives it to a 7-year-old-Elise, who presumably keeps it with her for the intervening 10 years until the Festival of the Sun is attacked. The problem here is that the blue Emerald never enters or leaves the loop; it didn't exist chronologically before Silver brings it to the Solaris Project, and it doesn't exist after Silver and Shadow warp out of the Radical Train fight arena. And, since it's been with Elise for the 10 years before the game, how did Sonic and Shadow use it to turn super and defeat Perfect Chaos, Finalhazard, Metal Overlord, and Devil Doom? Lighter colors represent traveling forward in time (faster than usual) and darker colors represent traveling back in time. The background's vertical line represents Solaris acquiring its form again in the Last Story. This is the second Sonic the Hedgehog game to get an E10+ rating by the ESRB, the first being Shadow the Hedgehog. The PEGI rating is 12+. Sonic '06 received widespread criticism on release, primarily due to numerous bugs, flawed controls and excessive load times. Many features hinted at during development were not implemented in the final release, and many in-game assets were given a graphical downgrade over what had been shown in earlier screen footage. Sonic Team have since admitted that the game was released in an unpolished and often unfinished state, citing strict development schedules and difficulties adjusting to new console hardware. The overwrought plot, in particular the relationship between Sonic and newcomer Elise, is the subject of much disdain among fans, though much of these elements are retconned by the game itself by wiping the main characters' memories at the conclusion of the story. 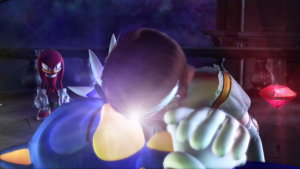 The many controversies surrounding Sonic '06 likely caused the distinct and noticable change of pace and settings witnessed in Sonic Unleashed and Sonic Colours. Few elements have been brought forward from this game, with the exception of Crisis City's inclusion in Sonic Generations (it too became controversial decision among some fans) and the character of Silver, who has made numerous cameo appearances in Sonic games and comic books since (despite making little sense in terms of game continuity). Mephiles also appeared as a playable character in Sonic Runners. Redesigned characters, particularly the taller Sonic and the almost entirely different Eggman, have since been reverted to their previous forms. Elise has not appeared in a game since. Sonic '06 is thought to have caused significant damage to the franchise, and while opinions vary on the recovery, this period is often cited as the lowest point in the Blue Blur's history. Try and incorporate this information into the main article. See the manual of style to find out why. Originally, the store was going to feature a purchasable gem that would allow the player to use Super Sonic in stages besides just the final one (similar to obtaining all seven Chaos Emeralds in Sonic 2, Sonic 3, and Sonic & Knuckles), but this feature was removed from the final game, most likely because of its rushed development. The gem can still be accessed through hacking, but isn't fully functional. Invincibility stars do not work for any character but Sonic. However, the stars disappear before your invulnerability runs out. During Shadow the Hedgehog’s story, the Scepter of Darkness is mistakenly referred to as the “Book of Darkness” at one point. Storywise, this is the only game to feature a villain who succeeded in killing Sonic, albeit soon followed by his induced revival. The instruction manual states that there are shields in the game, but there aren’t any. The manual also states that Tails and Omega can only fly until their Flight Meter depletes to zero. Neither character has a visible flight meter (and Omega can't even fly, only hover). Finally, the manual also states that by collecting Chaos Drives and Light Cores, Sonic can level up his equipped abilities. There are no level up mechanics in the game, and Chaos Drives do not make an appearance. The E3 2006 version of the game’s main song “His World” is a remix of a track that was originally intended to be in the final game, but was scrapped for unknown reasons. Thus, this track was dubbed “His World—The Lost Instrumental” by Sonic fans and people across the internet. An unreleased instrumental of “Dreams of an Absolution” also exists. The song "Town Mission 4" shares a similar melody to the music from Mega Man 2's Flash Man stage. Although both voice language tracks are included in the game disc, there is not a proper option to switch them in any platform and/or regional version, and the game sets both the text and voice language by default according to the console settings language, with the Japanese voices defaulted to Japanese console language and the English voices to the rest of languages. Therefore, the only way to have the Japanese voices on both the Xbox 360 and PlayStation 3 versions is by changing the console language (Xbox Dashboard in the Xbox 360 and console language option in the PlayStation 3) to Japanese in order to set the game entirely in Japanese. SEGA OF CHINA Staff: Makoto Uchida, Katusnori Kosuge, Cheng Li, Shao Mingzhu, Li MuZhang, Fang Jie, Sheng FeiFei, Bao JanGang, Mei Ling, Liu ChengLing, Yu YongQing, Li Shuo, Jing Huan, Digital Media Labo.,ink, Polygon Magic,ink. CG Movie: AOKI Prod., Blur Studio, Inc., SHIROGUMI INC., FORO GRAFICO CO.,LTD., GEMBA.Inc. Motion Capture Actors: WONDERMAN, Tony Hosokawa, Iori Sakakibara, Ami Sakai, Tomomi Ohta, Naoyasu Achi, Wataru Koga, ACTION ACTOR GROUP "KATSUGEKIZA"
Motion Capture Data Editing: DOUBLE-O-BUCK Inc., ORBITAL LINK Inc., Dynamo Pictures, Inc. Casting Director: Dawn Hershey, C.S.A. This page was last edited on 12 April 2019, at 15:50.